The faux leather extra large 180cm Slob Slab™ Bean Sofa™ beanbag has the ability to seat up to 5 people and is ideal for extra seating! 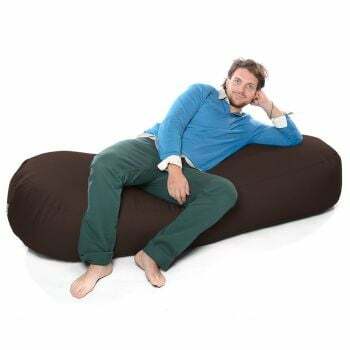 This beanbag can also be used as a bed for anyone under 6ft. The faux leather bean bags are modern and chic and are the perfect alternative to real leather beanbags. The fabric is comfy, strong and can be wiped clean. Keeping it looking at its best for years to come. Giant beanbag! Fits all the kids on at story time. The best thing about it that we can wipe it clean after the kids have been on it. Good quality product which I use in my creative/chill out space at home. Would definately recommend to family and friends. Exactly what I wanted, big and comfortable, suitable for every day use and appears to be good quality so far. Would recommended to any one, they are large enough for a big guy, or a snuggling couple. And quality is of the highest standards. Great for the playroom! Easy wipe clean and can fit all the family on!